Cook the spaghetti squash in one of 2 ways: 1) Cut in half and bake @ 375 F cut side down on a baking sheet until soft (about 45 mins) OR 2) Cut in half and place cut side down with 1/4 cup water in glass baking dish in microwave. Cover and seal with plastic wrap and microwave on high for 7-10 mins until soft. After the squash is cooked, use a fork to separate the strands into a bowl. Note: if you are using the microwave method, there will be extra water in the squash. Separate strands into a colander and let strain before use. Divide mixture into 5 equal parts and roll each of the parts into 4 equally sized meatballs. Place all 20 meatballs on a baking sheet lined with aluminum foil. Place meatballs in a preheated 375 F oven. Bake for about 20 mins or until cooked through. Combine all sauce ingredients into a saucepan on medium-low heat. Whisk to combine completely. Cook on a simmer until slightly reduced and thickened. 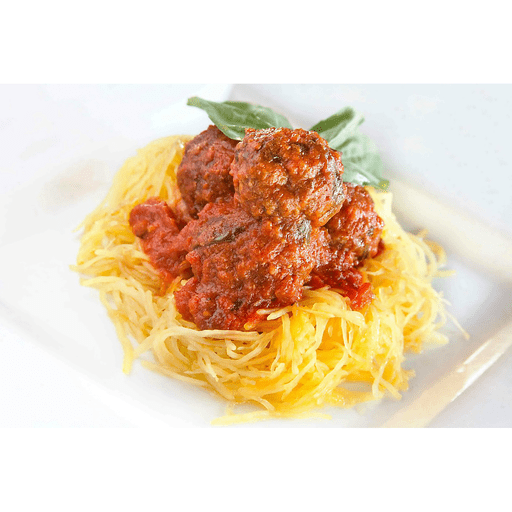 Serve meatballs on a base of spaghetti squash and drizzle with sauce. Enjoy!